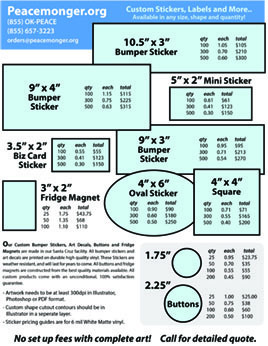 Order custom stickers, buttons, or magnets here for your business, band, cause, etc. in any size, shape and quantity! If you have custom contour cut requirements, the cut contour must be on a separate layer in Adobe Illustrator from the artwork. 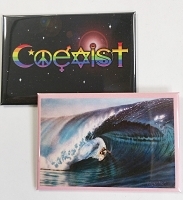 Our Custom Bumper Stickers, Art Decals, Buttons and Fridge Magnets are made in our Santa Cruz facility. All bumper stickers and art decals are printed on durable high quality vinyl. These Stickers are weather resistant, and will last for years to come. All buttons and fridge magnets are constructed from the best quality materials available. All custom products come with an unconditional, 100% satisfaction guarantee. NOTE: Additional fees may apply depending on setup work needed.